THIS DRESS HAS BEEN SOLD! 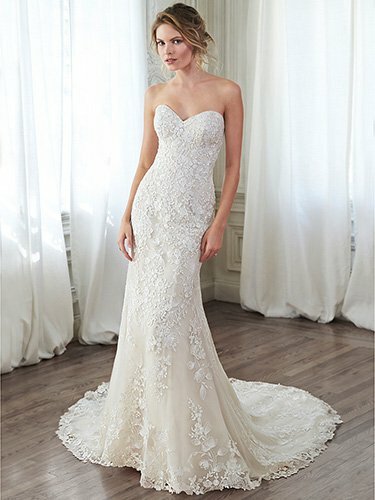 The Maggie Sottero "Arlyn" is a slim lace A-line gown that channels timeless elegance with its classic sweetheart neckline, cascading floral lace appliqués, and lace-trimmed hemline. This is a used dress that has been recently dry cleaned and is in great condition. 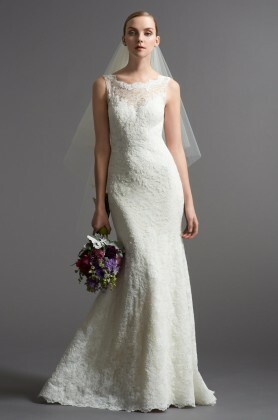 The dress was originally a size 10, but has been altered to fit more like a size 8. While the photo in the listing features an ivory dress, the one we have available is champagne.